"International Food, Equipment & Catering Show." 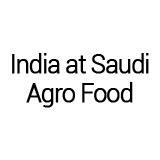 India at Saudi Agro Food is Saudi Arabia's longest established food exhibition. This bi-annual event will again be the Kingdom's leading food industry event providing an opportunity to introduce new products, equipment, and technologies. This event was great and I would like to be a part of more events in the years to come. It was good experience and would like to attend same type of exhibitions in future. Arrangement was quite good . Copthorne Hotel Riyadh by Mille..